We instinctively shudder at any mention of the immensely silly CueCat, but we really liked this piece in Promo Magazine. Anyone whose memories of the Internet economy extend back to sock-puppet spokesmen and sites devoted to toys should remember the CueCat, a cat-shaped handheld barcode reader that plugged into the computer. It allowed users to scan special barcodes in print magazines or on product packages and get linked to a URL offering more information about the story or product. CueCat is now an answer in the dot-com version of Trivial Pursuit. But interactive print is back and building momentum, thanks to the CueCat already in everyone's hand, so to speak: the mobile phone. Several tech platforms are taking different roads to incorporate mobile phone capabilities — text messaging and cameras — into offline marketing, and in the process building a new backchannel for print, broadcast or out-of-home promotions. For example, pick up the current July/August issue of Men's Health magazine and you'll find that you can get coupons, samples, content or just product information simply by taking pictures of any of the ads and sending the photos as multimedia messages to MH@snaptell.com. Clicking a photo of an ad for a Dolce & Gabbana men's cologne, for example, returns a text message containing a URL for retailer Macy's and a discount offer on shipping for the $70 product. Snapping an ad for Westin Hotels & Resorts produces a vacation-themed ringtone download. And an ad for the Chevy Malibu produces a link to a mobile site offering very full product specs and consumer reviews of the latest model. Other brands taking part in the Men's Health initiative include Honda Motors, Anheuser-Busch, Quaker Oats, The Coca-Cola Co. and Procter & Gamble. SnapTell licensed the technology to Men's Health publisher Rodale, which then used the enhanced interactivity in sales pitches to its usual advertisers. “This treats mobile not as a standalone channel, but as an integrated enhancement to other forms of advertising,” Schneider says. He says SnapTell will power portions of a Rolling Stone print issue this fall — its second partnership with that magazine after an integration last September. Mediabistro.com has launched three new blogs: MobileMarketingToday.Com, MobileDevicesToday.com and MobileAppsToday.com, which join Media Bisto's MobileContentToday.com blog. Mobile Marketing Today looks like it will be a great place to keep up with the good, the bad and the just plain odd in the mobile marketing world. We're wondering why Ralph Lauren is making its customers download software and scan barcodes to "quickly" access the brand's new mobile shopping site -- Lauren figures that people will happily "use their phone to scan barcodes on ads in magazines, and even in store windows," according to an article in Pocket Lint. SnapTell's Snap.Send.Get could have effortlessly whisked customers to the Lauren site, all they'd need to do is snap pictures of the products in question. Our solution works on any phone, and requires no software download, no scanning of barcodes, no adding ugly barcodes to ads and window displays. AT&T wants mobile app developers in New England to create the Next Great Mobile Application, in what the company is describing as "a high-tech version of 'American Idol. The grand prize winner gets $10,000 in cash and a slot on the AT&T devCentral Web site, plus the application will be promoted in all AT&T-owned stores in New England. National versions of the Fast-Pitch program have resulted in such apps as Ascendo Fitness, My Local TV News Over Wireless and Mobile Comic Books by uclick, this is AT&T's first regional challenge. Better move fast, the contest ends September 30th -- see the entry information here. Publishers Weekly has a detailed article analyzing the success of Random House’s Vroengard Academy, a virtual world and online game based on the wildly popular Inheritance cycle novels by Christopher Paolini. SnapTell’s Snap.Send.Get mobile marketing platform is being used to power some of Vroengard Academy's online and offline scavenger hunts; players must figure out clues, search for specific items and then snap pictures of the items with a camera phone and send them to the academy via MMS. According to Leonard, there is a 45% return rate among users, which shows the number of players revisiting to the site to check their progress and complete weekly challenges. She adds that a return rate of this level is high for this kind of campaign, and that there is strong participation among girls, with a 60/40 split between male and female players. A two-week viral marketing campaign, which involved a “lost dog”-style teaser poster campaign, led up to the game’s launch. Once the game started, Random introduced three additional promotions in U.S. cities throughout the summer. During the first of these, sites in Austin and San Francisco were painted with Vroengard Academy murals, and street teams passed out 5,000 flash drives, which contained a “lost chapter” from Eragon, as well as an audio clip from Paolini. Online maps directed fans to the giveaway locations. Are you ready to be a Dragon Rider? If so, enter Vroengard Academy, a virtual game developed by Random House Publishers and based on the wildly popular Inheritance cycle novels by Christopher Paolini. Vroengard Academy is an interactive version of the world of Alagaësia, the setting for Paolini’s books. 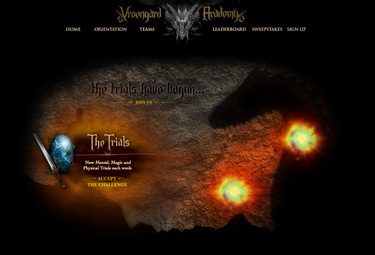 At the Academy students learn to become Dragon Riders by working their way through a series of entertaining but tricky trials testing their mental, magic, and physical skills. SnapTell’s Snap.Send.Get mobile marketing platform is being used to power some of the online and offline scavenger hunts; players must figure out clues, search for specific items and then snap pictures of the items with a camera phone and send them to the academy via MMS. Snap.Send.Get’s image matching technology then returns additional information to the players’ phones, enabling them to progress further in their game and dragon-rider studies. The quicker that players snap and send their images after they are assigned a new quest the more points they score for themselves and their teams. Team scores are posted on the Academy website. Each week, new magical, physical, and mental trials will be added. Players are eligible to win prizes, including a trip to Montana have lunch with Christopher Paolini. According to media reports over 20,000 people are signed up to play the game. Some of the players have created their own blogs about the Academy, such as this terrific one by a 13-year-old in Colorado. The third book in Paolini’s Inheritance cycle will be released at 12:01 a.m. on Saturday, September 20, 2008. SnapTell is pleased to be part of what we think is cool and challenging game. For more information about Snap.Send.Get, please visit our website or email us at bizdev@snaptell,com. In this short video clip from BNET TV, Gautam Bhargava, co-founder and CEO of SnapTell, explains how brand owners and publishers can use SnapTell's Snap.Send.Get solution to easily mobilize virtually any existing marketing collateral, transforming it into a mobile marketing campaign that's easy and fun for end-users to explore.